The 100th Running of the Dipsea was one for the ages. Extreme ages. It was won by 52-inch, 62-pound, 8-year-old fourth grader, Reilly Johnson of Mill Valley, who beat a 68-year-old grandmother of four, Melody-Ann Schultz of Ross, to become the youngest runner ever to win the Dipsea, topping then 9-year-old Megan McGowan in 1991. The Tam Valley student and the three-time Dipsea champion left downtown Mill Valley in the same group – with a 25-minute head start over scratch runners – and after 7.51 miles on the Dipsea trail Johnson won the time-handicapped race to Stinson Beach by seven seconds. "I just think it's wonderful," Schultz said. And to think that "Reilly In Wonderland's" race almost ended in a tie. "If I did catch her at the last minute, I would have grabbed her hand and we would have gone over the line together," Schultz said. "That was my thoughts." Johnson was leading Schultz going into the Swoop, about two miles from the finish line. But she tripped and thought she put her possible victory in serious jeopardy. "She said, 'Oh, no.' and I stopped and I pick her up. I couldn't not stop. She was right in my way," Schultz said. "I said, 'C'mon darling. Get up!" The little pixie and the Dipsea queen ran neck-and-neck down Steep Ravine but, going up Insult Hill, Johnson passed Schultz for the last time. "She was like a gazelle ... zoom!" Schultz said. "I ran so relaxed. I just ran within myself. I think I pushed her." Roy Rivers, the 53-year-old 2009 Dipsea champion from Mill Valley, finished third and was more surprised than disappointed. "I ran exactly what I thought I would do," Rivers said. "I just never thought an eight-year-old would run that fast." Johnson, who finished 199th in 2009, ran 15 minutes faster this year. Her clock time was 47:31, adjusted after the 25-minute head start. 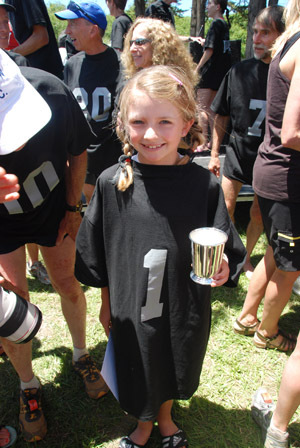 In her first Dipsea in 2008 at the age of six, Johnson became the youngest Dipsea runner to qualify for the Invitational Section as her father, Hal, sacrificed his own Invitational status to run with her and help shepherd her through shortcuts. "When she started training, the original goal was to get her a black shirt (awarded to the top 35 finishers in the race) and then she trained and trained and trained," Hal Johnson said. "Then we started doing times on the course and her times were so fast that we thought she could win this. We knew that as a family but then other people in the (running) community were seeing her times and then we started putting it all together." Johnson, who did her third grade history report at Tam Valley on the Dipsea, was so excited about the race on Saturday night that she had a hard time sleeping. "I kept thinking, 'I might win it. I might win it,' " the 8-year-old said. Fortunately, her mother, Wendy, managed to convince her daughter to take a nap on Saturday afternoon so she wasn't too tired from her anxiety attack on Saturday night. "Only Brian Pilcher (the 2009 Dipsea winner) accurately predicted her winning," Wendy Johnson said. "I am in awe." So was Johnson's father. She beat him by 63 places. The 8-year-old and 68-year-old helped the Tamalpa Runners win the team/club trophy for the umpteenth time, withstanding a strong challenge from the newly-formed Pelican Inn Club. Alex Varner, a 24-year-old scratch runner from San Rafael, finished fourth overall and won the best-time trophy for the second consecutive year. Chris Lundy of Sausalito recorded the fastest time by a female placing 11th overall. John Lawson, 15, of Forest Knolls was the first male high school finisher and 18-year-old Jacqueline of Petaluma was the first female high school runner to finish.